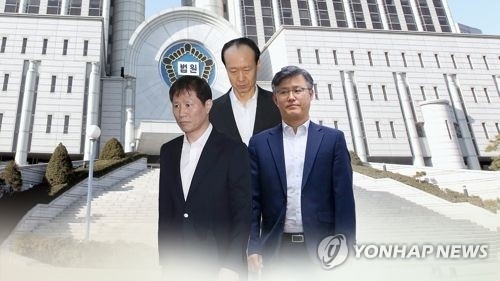 SEOUL, July 12 (Yonhap) -- A Seoul court on Thursday handed down prison terms of 18 months to 2 1/2 years for two of the closest aides to former President Park Geun-hye and suspended the sentence for another on charges they took illicit funds from the spy agency and delivered them to Park. The three were indicted for playing roles in Park's taking of between 50 million won (US$46,000) and 200 million won every month from May 2013 to July 2016 -- a total of 3.5 billion won -- from the National Intelligence Service. But the court ruled that the National Intelligence Service (NIS) fund they took cannot be seen as bribes, but a misappropriation of state funds by the NIS provided to the ex-president. The three were considered so close to Park that they were dubbed in the media the "doorknob trio," a figure of speech implying they were holding the knob of the door leading to Park and that everything had to pass through them to reach her.